For once, I was more attracted by jewelry than by clothes at Valentino 2016 Summer Couture Fashion Show. On long dresses inspired by Antiquity or Middle Ages, necklaces became also belts. This idea can be reproduced to boost a dull outfit by wearing two crossed long necklaces over the shoulder. You can see pictures of this Fashion Show on Vogue and Style Bubble websites. Armani Privé fashion show was the one I prefered at 2015 Spring-Summer Couture Fashion Week. 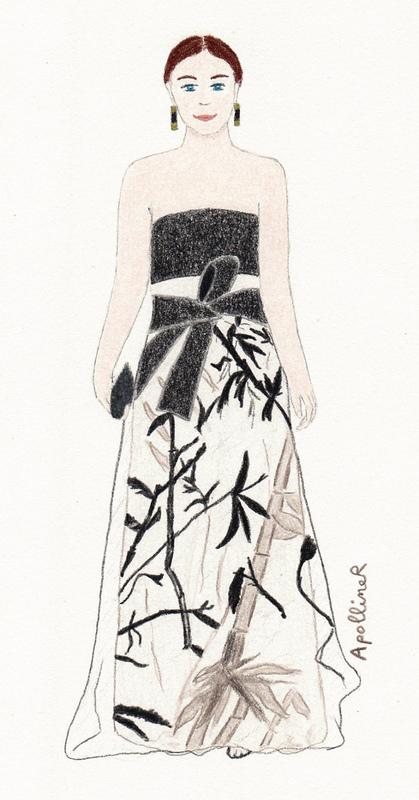 The outfit I have drawn is made up of a black bustier, a beige skirt and a black tulle skirt with a bamboo pattern. A wide belt is tied on the skirt. I like the Japanese inspiration of the bamboo print and the belt that reminds a kimono belt. This inspiration can be found in all the collection that is both zen and smart. I have also drawn a tutorial to do the same belt knot. You can see all the pictures of this Fashion Show on Vogue website. The white jacket with black braid is a Chanel signature. There have been many variations of this cardigan-jacket. This year, the idea has been used for a white short sleeve trapeze dress at Chanel 2014-2015 Fall-Winter Couture Fashion Show. There is a grey vertical line in the middle of the dress. Other horizontal lines emphasize the high waist, borders and pockets. The result is a geometric and minimalist dress that I would gladly wear. You can see all the pictures of this Fashion Show on Style website. I spotted this outfit at Armani Privé 2014-2015 Fall-Winter Couture Fashion Show. It reminds me of the Little Red Riding Hood because of the cape coat. 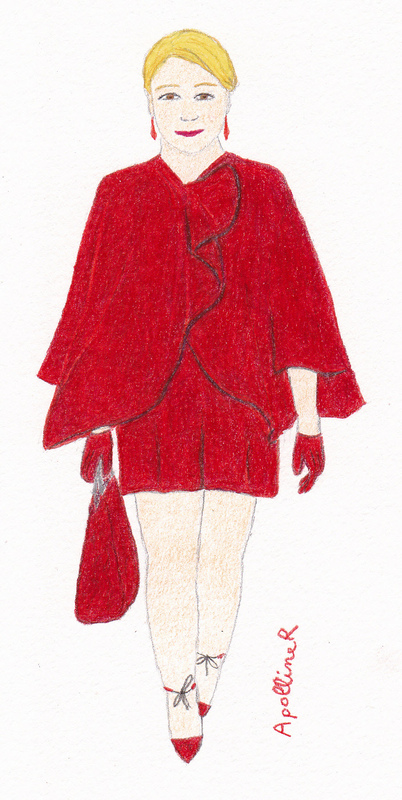 But a modern Red Riding Hood who wears formal shorts, court shoes, short gloves and a businesswoman bag. 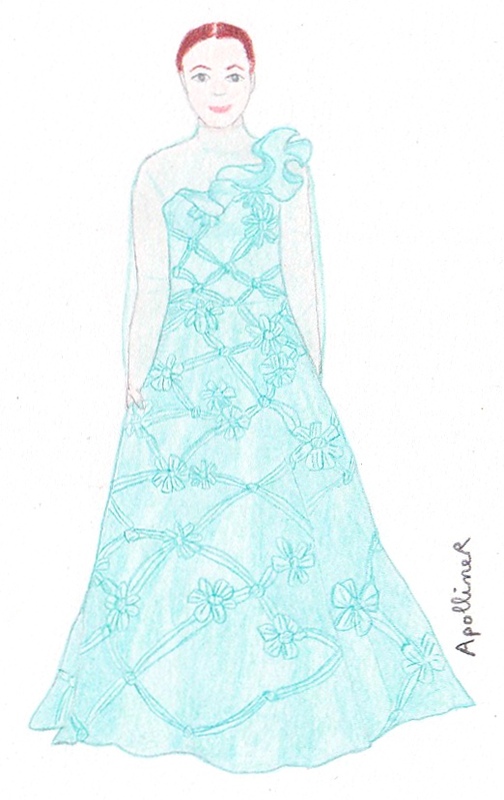 While watching Valentino Couture Spring-Summer 2013 Fashion Show, I spotted this sea-green princess gown with floral embroidery but maybe not for the good reason. I thought it would make magnificent curtains. Like in Gone in the wind but the other way round, I would gladly turn this dress into curtains. Now, it’s also spendid in its dress form. You can admire this Fashion Show’s great embroidery work on Vogue and Popsugar fashion websites. Dries Van Noten Spring Summer 2013 Fashion Show experiments with mixing prints. The following look is matching a big floral print shirt with a checkered top. 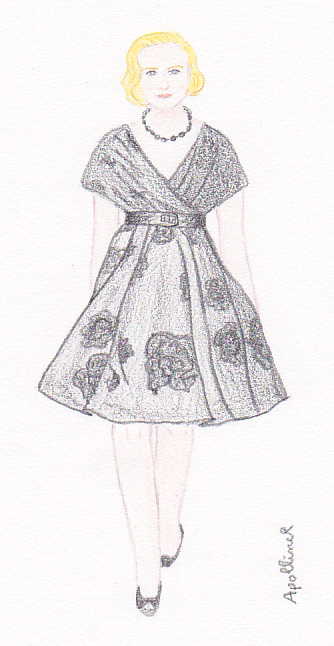 The second model I have drawn is wearing a tartan skirt and a tartan shirt. But the tartan of the skirt and the tartan of the shirt have different colors et different lines’ patterns. Some combinations work well and others work not so well but to know it, you have to try. This collection makes me want to go through my wardrobe and to mix up my clothes in an unconventional way. You can see the other outfits of the fashion show on Vogue and on Fashionologie websites. A few weeks ago, actress Kate Bosworth attended the Burberry Fall Winter 2012 Fashion Show. She could as well have paraded among the models since she was dressed the same way. Pictures of the celebrities who attend Fashion Shows are widely distributed in particular on the Internet. Hence, some celebrities are asked by designers to wear clothes from their latest collection. On my illustration, Kate Bosworth is wearing a grey sweater with a drawn owl and a brown below-the-knee pencil skirt with big pockets. She’s also wearing high-heel shoes that look like clark shoes. I like the marriage of a casual sweater with an elegant skirt. However I would have gone without the black bow belt. It’s a simple look that can be easily recreated by combining a pencil skirt with a graphic sweater.